This Corner Bookmark Tutorial is a short video for those who prefer to learn by watching how it's done. This simple little project is one that you can dress up any way you wish and will make a lovely little gift for family and friends. The paper I have used is from a paper stack that was free with a magazine I bought, and all the colours in the pack will all blend together. Some of the pack I used was double sided paper but if you don't have any then you can line the bookmark with another sheet of paper as we go along. The Video tutorial is not long, and it is the visual way that many people prefer to learn ... me included. But if you would rather read what to do then here are the written instructions. The bookmark that it produces will be big enough to cover the edge of the page without falling off. But remember that anything you add to the card will prevent the book from closing when it is laid down ... so keep them as flat as you can. No fancy flowers on this one then!! It is a good way to use up some of those pretty sheets of paper you have in your "Stash" ... the ones you have been saving and stroking for ages. The size of the paper you start with will also influence the size of the finished bookmark too. 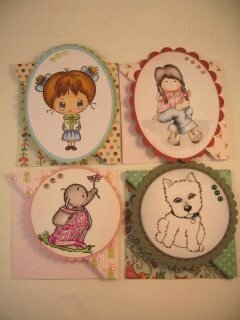 You will find many ideas for small gifts in the Easy Projects and Papercrafts that will be especially welcome for Christmas and Birthdays. Or even for special occasions like Mothers Day, and this is another idea to add to your repertoire. They are always a much more personal touch to any card that you give. I am sure that the recipient would be delighted with, treasure, and appreciate the time you have taken to make some thing just for them.